I am forever throwing stuff together into a skillet and seeing how it cooks up. Seriously. Do you do this, too? I had some produce I needed to use up and some Thrive Ham Dices that I needed to use, so I just kind of cut it all up and came up with today's post. It was really good! And filling! And healthy! The meal trifecta. Heat up olive oil in a medium to large skillet. Add all ingredients except cheese. Saute until veggies are cooked, but not mushy. 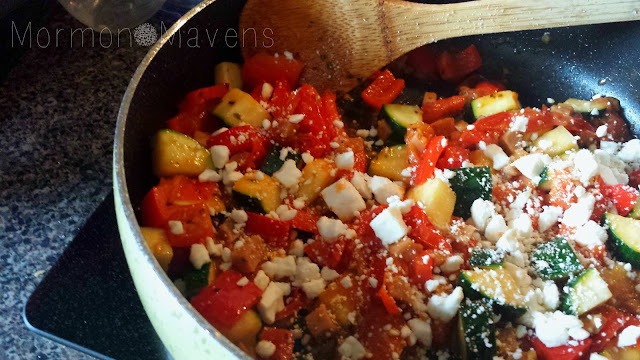 Add in Feta Cheese and stir to combine. Serve.